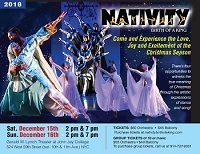 NATIVITY: BIRTH OF A KING is a full-scale dance drama that unveils the events surrounding the birth of Jesus Christ through the artistic expressions of dance and song. This theatrical production incorporates 100 cast members (representing over 50 churches), 20 dance scenes, pre-recorded and live music, featured soloists and a 50-voice choir to convey the cultural conditions surrounding the birth of Christ. Come and Experience the Love, Joy and Excitement of the Christmas Season. There’s four opportunities to witness the true meaning of Christmas through the artistic expressive of dance and song! People are flocking to this creative interpretation of the birth of Christ! Don’t miss it!